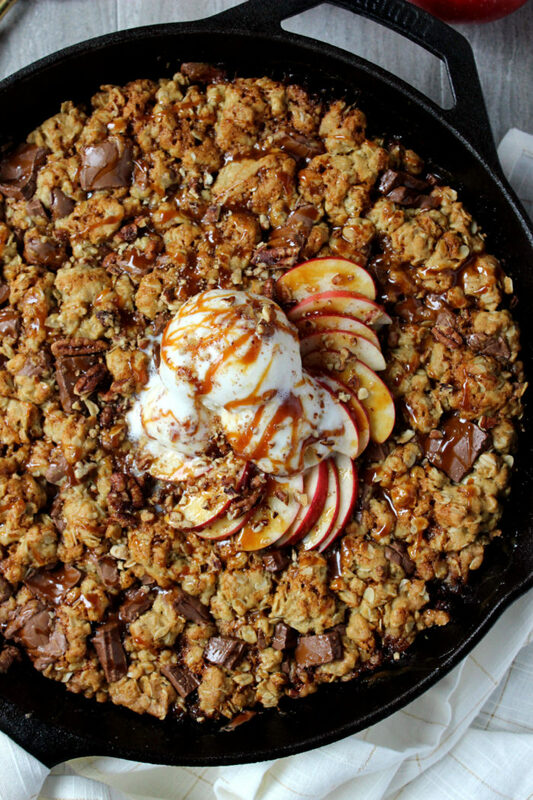 This skillet cookie is what we call multi-tasking. Two desserts, one dish, countless happy customers. 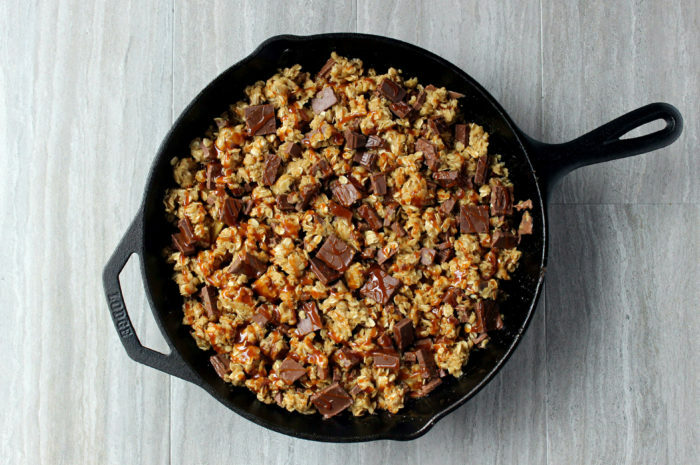 Serving this on Thanksgiving would definitely be untraditional, but seeing as 2016 is one giant “is this real life? !” melodrama, why not? Weird is the new norm, so let’s be trendy. 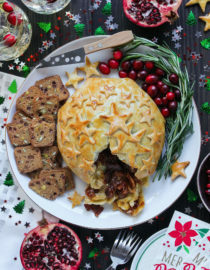 The best thing about this cookie — besides the look, the smell, and how insanely good it tastes — is that its super easy to put together and can be prepped well in advance of your T-day plans. You begin with fresh honeycrisp or gala apples, which are my favorite variety because of their texture (crunchy) and flavor (juicy + sweet). Slice ’em up into neat slivers, then saute them in a mix of butter, brown sugar, cinnamon, and nutmeg until just becoming tender. 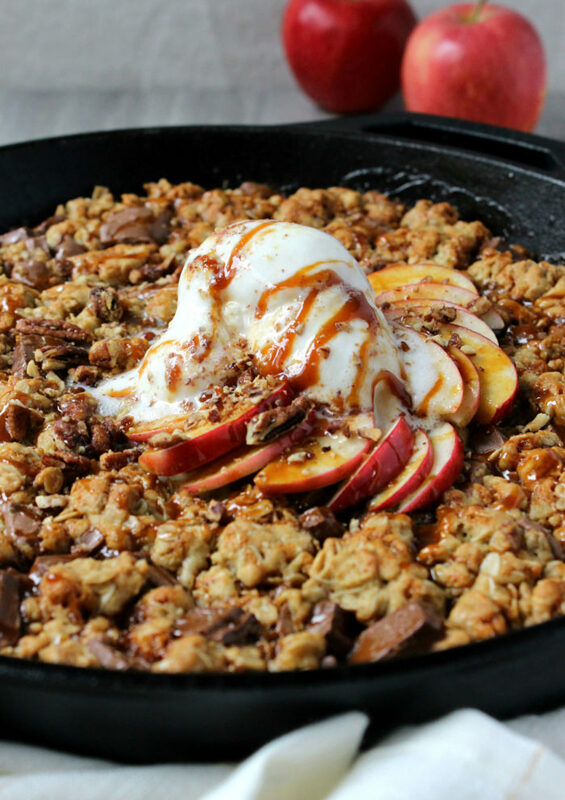 The idea is to mimic a classic apple pie filling, so trust that the aroma is amazing. 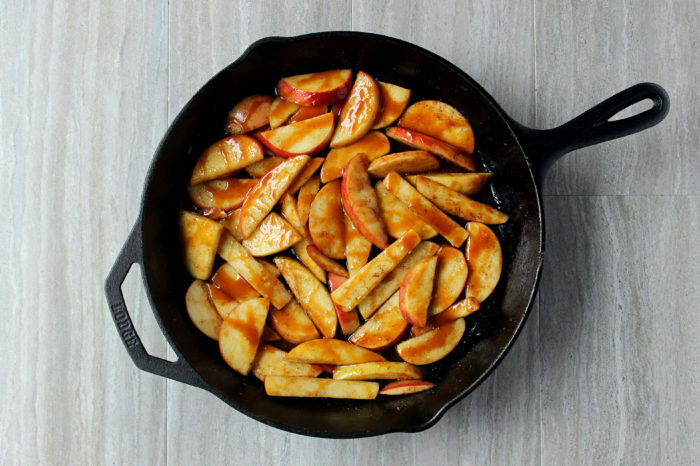 Once the apples start to soften, drizzle them with a whole bunch of caramel sauce — YES! — before topping with your cookie dough. 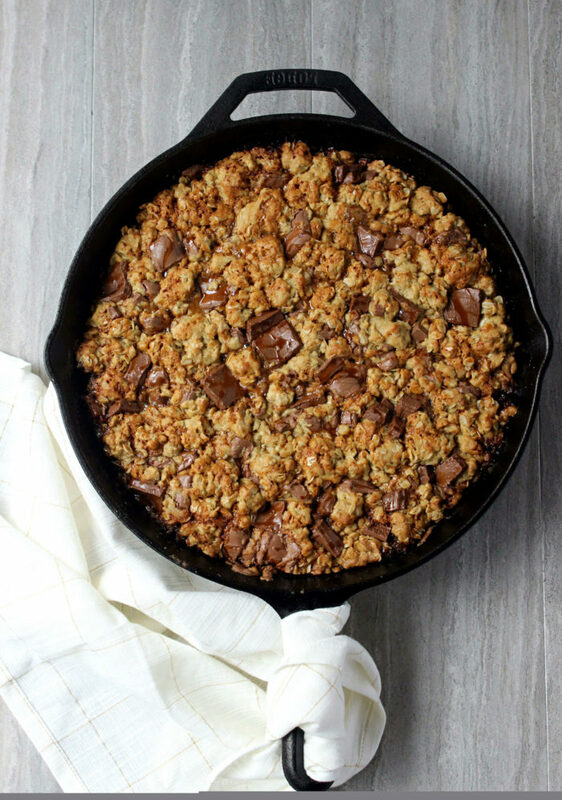 For those of you who’ve never made one, a skillet cookie is just like making regular cookies, so there are no surprises here. 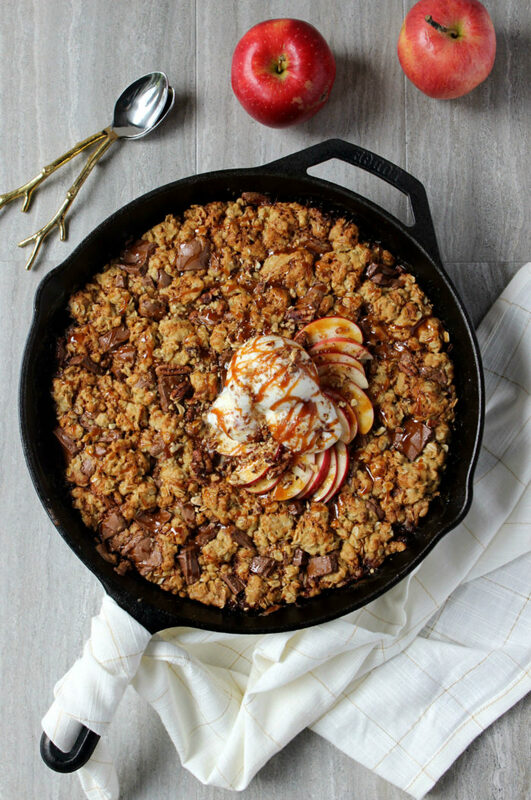 A mix of dark brown and white sugar lend balance to the cookie’s density, while the oatmeal renders an even crispier cookie to sop up those delectable apple pie juices. And of course, the bigger the chocolate chunks, the better! Chopping your own chocolate takes about 8 seconds, so definitely skip buying those pre-packaged chips. While sprinkling the cookie dough you’ll make intermittent drizzles of more caramel sauce, because I really love you guys. 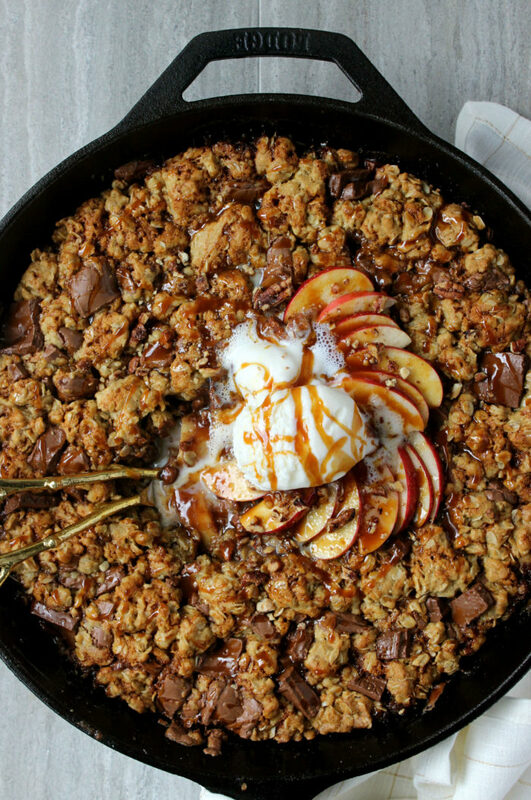 The caramel might seem a bit extra, but it adds a candied-apple taste to the apple pie filling (INSANE!) while weaving bronzed threads of sticky, gooey, sugary goodness throughout the cookie, so it’s a total must. And once you can’t stand just how amazing your masterpiece looks, pop it in the oven for 25 minutes and let the drooling commence. The flavor profile here is SO tremendous, it’s hard to put into words. 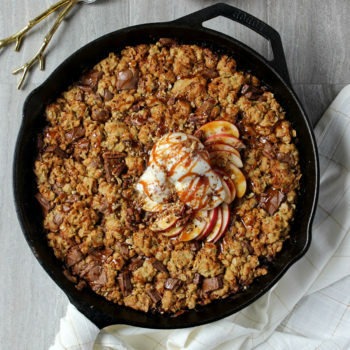 Sweet, spicy, aromatic apples glazed with caramel, giant pillows of chocolate chunks, and a cookie that’s chewy, soft, and crispy all at once. 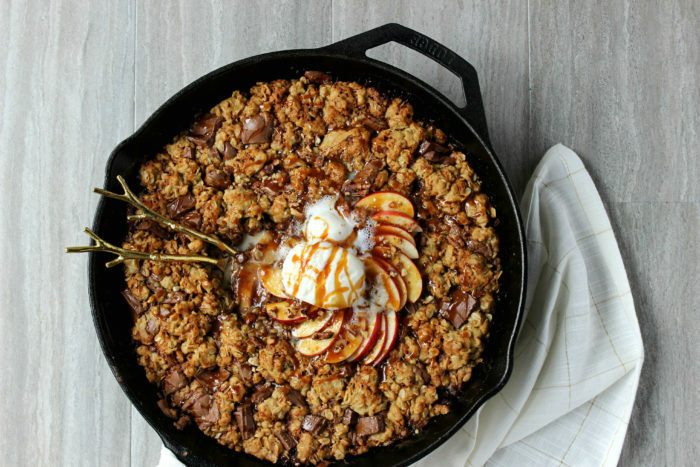 It’s a stunner, for sure, and when you top it with vanilla ice cream + more caramel drizzle. The cookie dough can be made up to two days in advance and stored in the refrigerator in a mixing bowl covered with Saran wrap. If you do this, simply thaw the dough on your kitchen counter for 10 minutes before using it. 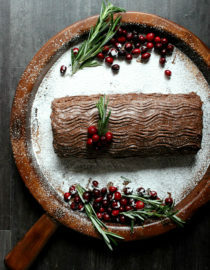 For T-day serving: Bake in the morning, leaving it slightly undercooked (in the oven for about 18 minutes) then cover with aluminum foil or Saran wrap at room temperature. 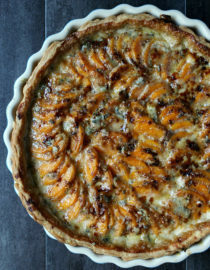 When needed to serve, reheat it uncovered at 325F for 8 – 10 minutes, then devour! This serves 8 generously, but could really feed up to 12 people. Begin by preparing the cookie dough. In a large mixing bowl combine the flour, baking soda, and salt, then whisk in the oatmeal. In another mixing bowl combine the butter, dark brown sugar, white sugar, eggs, and vanilla, whisking until smooth. Slowly add the dry ingredients to the wet, stirring until the dough takes shape. Lastly stir in the milk chocolate chunks, then chill in the refrigerator until needed (no longer than 1 hour). Prepare the apples. 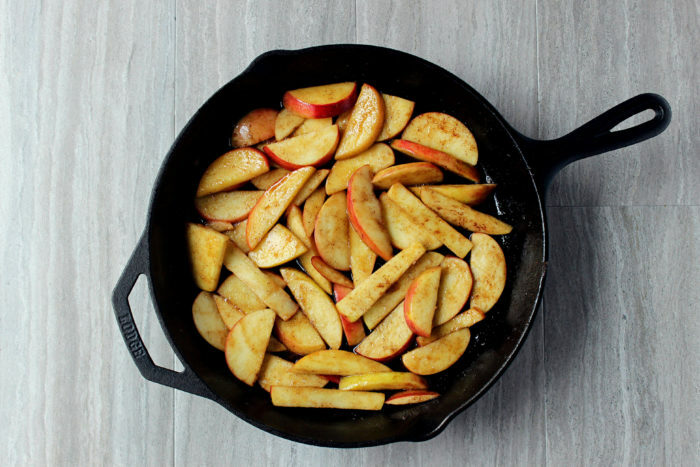 In a cast-iron skillet melt the butter over a medium flame, then stir in the sliced apples, dark brown sugar, cinnamon, and nutmeg. Sauté for 5 minutes until fragrant and beginning to tenderize, then remove from flame. Drizzle the apples with a touch of caramel sauce, then cover with half the cookie dough. Drizzle more caramel, then cover with the remaining cookie dough and one last drizzle of caramel. 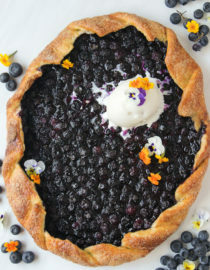 Bake for 22 – 25 minutes until cookie is firm at the edges but not overdone. 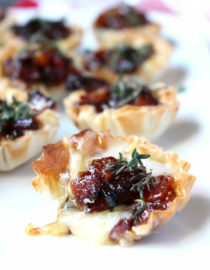 Cool slightly, then top with ice cream, more caramel sauce, and serve. Looks amazing! Which caramel sauce do you recommend?